CUTE! Sock Monkey Ski Style Bomber Hat w/ Poly Fleece Lining ONLY $4.99 + FREE Shipping (WAS $40)! You are here: Home / Great Deals / CUTE! 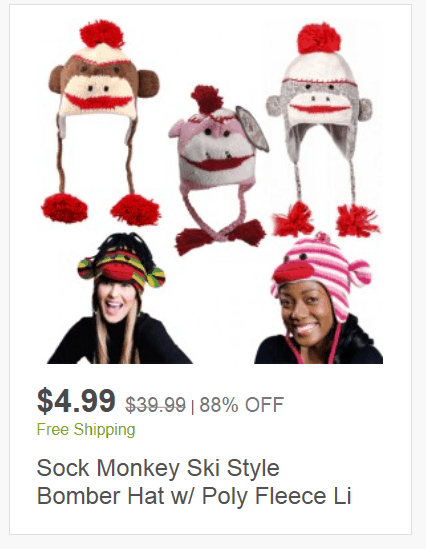 Sock Monkey Ski Style Bomber Hat w/ Poly Fleece Lining ONLY $4.99 + FREE Shipping (WAS $40)! Hurry and snag one of these CUTE Sock Monkey Ski Style Bomber Hat w/ Poly Fleece Lining for ONLY $4.99 + FREE Shipping (WAS $40)!